Too many mouths to feed? Just make your babies fight each other to the death! That's a strategy some bird parents have been using since even before The Hunger Games was popular. It means the strongest chicks get stronger while the weakest ones conveniently stop showing up to the table. One type of bird takes this family drama a step further: after letting the biggest chicks bully their siblings for a while, parents suddenly decide the runts are their favorites and begin beating up the older chicks themselves. Authors looking for the next dystopian mega-hit, take note. The polite way to say "letting half your babies die" is "brood reduction." Why hatch a runty egg at all? Parents may allow more siblings to live if food is plentiful. Or a second egg might be a kind of insurance in case the first doesn't hatch. American coots are waterbirds that lay large clutches of eggs and may space out their hatching over a week or more. This means some siblings end up much heftier than others. At first, young coots follow their parents around, relying on their parents to feed them insects and plant material they find by diving. Siblings don't physically attack each other, but older birds easily out-jostle smaller ones for food. Half of all chicks die of starvation. Over several years, Shizuka and Bruce Lyon, an ecologist at the University of California, Santa Cruz, monitored 75 American coot families on a lake in British Columbia. They snuck every new chick away as it hatched to give it a color-coded tag. Spying on these families while their chicks ate or starved, the researchers discovered a highly unusual system at work. 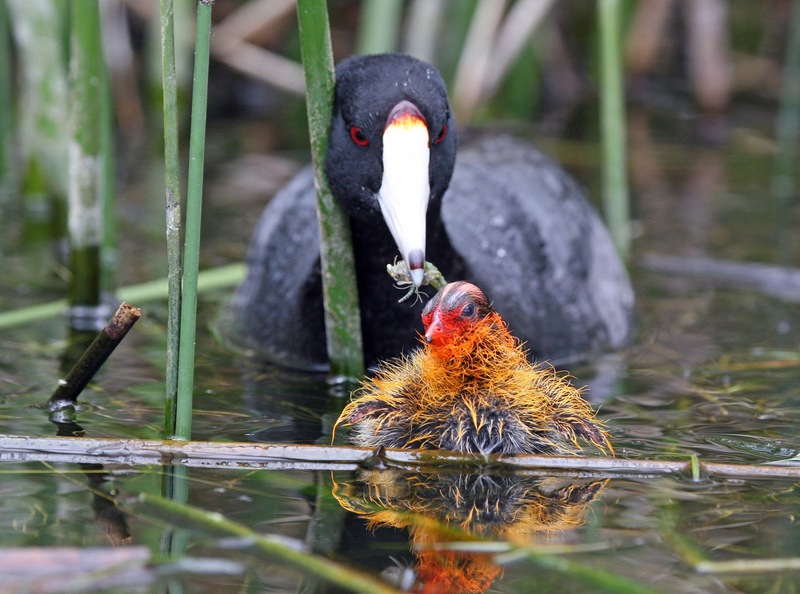 During the first 10 days after hatching, younger coot chicks often died of starvation. But any runty chicks who survived this period saw their luck turn around. Parents suddenly started playing favorites. Each coot parent picked one preferred chick out of those who'd hatched last, and gave that chick the most food. Heightening the drama, moms and dads each chose a different favorite. To discourage bigger siblings from asking for so much food, the parents spent more time "tousling" these birds. In humans this means "affectionately messing up someone's hair," but in birds it means "grabbing your baby by the head and shaking it." As you might imagine, it's pretty convincing. The beefy siblings backed off. Once parents switched to spoiling the runts and beating up the bigger kids, late hatchers became just as likely to survive as their siblings. The youngest chicks even grew slightly larger than their older brothers and sisters. This system may be a way "for parents to try to get the best of both worlds," Shizuka says. First, coot parents allow brood reduction to happen, watching their chicks compete to the death. Once the family reaches its optimal size, he says, "parents can take matters into their own hands to make sure that the youngest chicks that are still surviving end up getting enough." Don't throw out your parenting books yet. Although this method seems to work for the coots, scientists still aren't sure why so many birds have evolved elaborate strategies that require siblings to murder each other—or why chicks go along with it. Shizuka says, "It's safe to say the matter is not resolved."